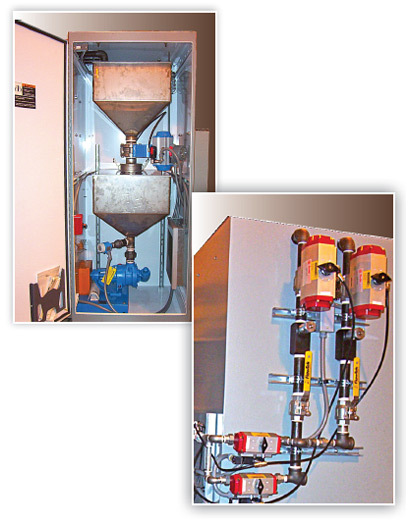 Design a system to accurately weigh two types of oils to be pumped into a mixer to manufacture rubber. Customer specified the pump, scale, and the controls to use so they can add it to their existing control system. The two product system would be pumped from drums with drum pumps that they supplied. Some of the valves were also specified by the customer. The system would weigh the product in a weigh hopper. Once weighed to the appropriate amount, the product was dumped into a holding hopper where it would be introduced into the mixer as their process required. Once the first product exited the weigh hopper, then the second product was weighed. EASI provided a Pipe and Instrument Diagram based on the information provided by the customer. System included the following key components: 480VAC Viking pump assembly with gear reducer; Mettler Toledo Scale; Liquid empty sensor; Weigh hopper; Holding hopper; 4000W heater; (7) Air actuated ball valves; Butterfly valve.